No Wonder a2+b2=c2 was Greek to me ! —In a right triangle, the square of the hypotenuse is equal to the sum of the squares of the other two sides. 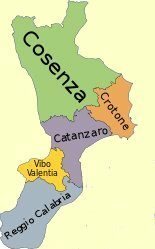 My plan is to go to Calabria, the town of Crotone (the map, below, shows the province of Crotone. Find the 'e' at the end and walk down to the town. It's at water's edge). Specifically, I want the high school, the Liceo Ginnasio Classico Pitagora at piazza Umberto I, 15. I intend to offer to teach their English classes for a whole week just so I can teach the kids one of the world's most complicated pun-stories, one that bears directly on their own town, indeed one that connects their town and themselves to every kid in the world who has ever studied geometry. And they won't have to pay me. I can drive it from Naples in a few hours, and I 'll cover my own expenses because I've got this great idea for a t-shirt. This is the story. It was my high-school geometry teacher's favorite. We were grade-bound to laugh long and loud (no groaning, please) every time he told it. We wound up with pretty good grades and really sore diaphragms. For the politically correct, I realize that the use of the S-word is potentially offensive. I do know that the word squaw derives from the eastern Algonquian languages and appears in various spellings to mean 'woman' and has often been generalized incorrectly and unfairly. I remind you that this is just a joke, for Pete's sake. For the zoologically correct, I do know that there are no hippopotamuseseses in North America. I remind you that this is just a joke, for Pete's sake. For the Ethical-Treatment-of Animally-correct —please get a life; I got the hides from Teddy Roosevelt. This is just a joke, for Pete's sake. Once upon a time, there were three pregnant Indian squaws. The first squaw was sitting on a buffalo hide, the second squaw on an antelope hide, and the third squaw on a hippopotamus hide. The first squaw gave birth to a baby boy, as did the second squaw; but the third squaw, the one on the hippo hide, had twin boys. So, what's the moral of this story? The squaw... on the hippopotamus... is equal to the... sons of the squaws... on the other two hides! Crotone is a great little town that you should visit even if you hate math; it has great beaches, a harbor and a current population of about 60,000. 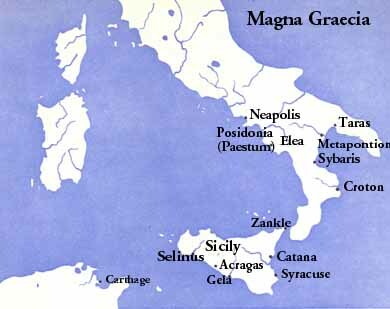 As long as you're there, however, know that it had a glorious presence as part of Magna Grecia. They had great athletes, famous philosophers, fine doctors and, best of all, this is where Pythagoras (image, above right) had his academy, founded in 510 BC. It was a monastic-like, ascetic order, dedicated to numbers—especially the relationships between numbers. It all led eventually to the science of mathematics, the powerful tool for describing and predicting natural phenomena. They were so intent on serious study that they got steamed at nearby Sybaris, the citizens of which were notoriously luxuriant, flabby and given to good times. Pythagoreans sent Crotone's great wrestler, Milo, over with an army of goons and wiped out the weak and meek Sybarites. We can forgive them. The -naissance part of renaissance was Greek: Thales, Anaximandros, Heraclitos and a legion of others were worthy of the name "scientist," as we understand that word today: one who knows from observation and investigation. "Science" is related to the word "scissors"; a scientist therefore cuts and divides. The Greeks were the first who tried to cut and divide, figure out and label the universe on a natural rather than supernatural basis. Pythagoras was right in the middle of them, and of all the figures of early Ionian science, none had more influence on future generations than did he. 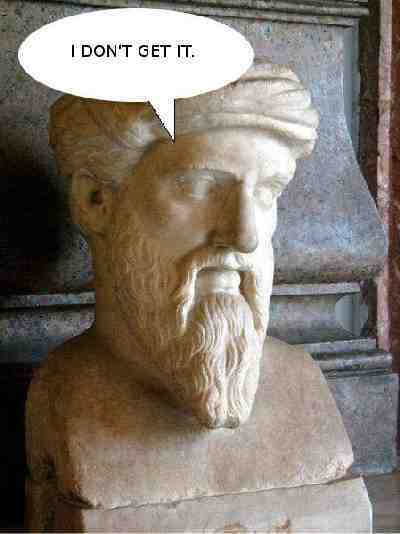 Pythagoras, of course, is most famous for the geometry theorem which bears his name and which was the foundation of the groaner at the beginning of this brief discourse. Of all the mathematical knowledge attributed to the Pythagoreans, the most important was the realization that not every quantity can be expressed in whole numbers. True, if the shorter sides of a right triangle are 3 and 4, then the hypotenuse is 5 (32+42=52; that is, 9+16=25), a fact that delighted the Pythagoreans. But, if the shorter sides are, say, 4 and 5, then the hypotenuse is not a whole number, but winds up as 6.4031242... , an unwhole number if ever there was one. This bothered the Pythagoreans and later generations of mathematicians no end. It doesn't bother me. Their love of beauty and symmetry and their love of numbers led members of the Pythagorean school to some important views about the nature of the universe. One disciple of Pythagoras, Philolaos, even suggested that the earth was a planet and, like all other planets, was in orbit around a "central fire" in the middle of the universe.